• None of the improvement would come from equipment upgrades or process improvements at existing fossil-fuel power plants. WASHINGTON – Blistering summer temperatures are already hard enough on Arizona, but they could become even more of a challenge if the state is required to meet carbon emission reductions proposed by the federal government, a state official said Thursday. When that happens the state has no option but to include coal-fired power plants to produce enough electricity to meet demand, Darwin said. That makes it difficult for the state to replace coal with cleaner sources of energy. 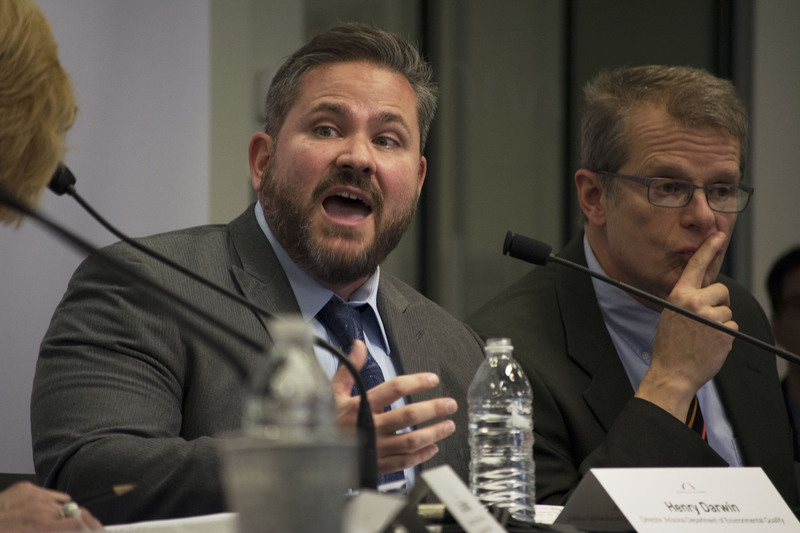 Darwin’s comments came during a Bipartisan Policy Center panel on the Environment Protection Agency’s proposed Clean Power Plan, where he was one of 11 state representatives, utilities representatives and policymakers. While they applauded the EPA’s effort to have conversations with stakeholders, the panel members were critical of the agency’s strict requirements and deadlines. Many said EPA was asking for too much, too fast. The Clean Power Plan proposal, set to be finalized this summer, aims to reduce carbon emissions nationwide by 30 percent by 2030. Goals were set for each state by assessing its current carbon-emission reduction strategies, resources and its “potential to reduce pollution,” according to the EPA website. The plan calls for Arizona to reduce its carbon emissions by 52 percent in the next 15 years, Darwin said. Eighty percent of that goal would have to be met in the next five years, he said. This represents the second-highest state goal in the country, trailing only Washington. The EPA based Arizona’s goal on average annual electricity usage, without accounting for summer spikes in electricity usage, Darwin said. About 25 percent of electricity used in Arizona homes goes toward air conditioning, according to the U.S. Energy Information Administration, compared to 6 percent nationally. Arizona relies heavily on coal power, which is more carbon-intensive than burning petroleum or natural gas for electricity, according to the EPA. An EPA spokeswoman said in an emailed statement that states can meet the emission reduction goals using any strategy they want. “EPA is not mandating the retirement of any coal plants. Decisions about whether and which individual plants may retire will be made entirely within that state planning process,” the emailed statement said. But Darwin said Arizona cannot meet the EPA’s proposed goals without retiring coal, something that is not feasible for the state by 2020 – the first proposed date for an interim check. The EPA received 3.5 million comments on the proposed plan and has consulted continuously with stakeholders on it, according to the agency’s statement. “We will consider all comments, including those related to concerns regarding coal retirements and reliability, as we develop a final rule,” the emailed statement said. Darwin said the state is taking the EPA at its word. “Despite these challenges, we’ve been working with EPA to provide our concerns and comments, and we’ve been providing them data to back that up,” Darwin said. 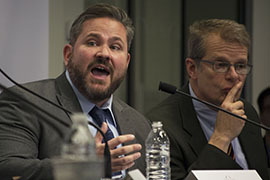 Arizona Department of Environmental Quality Director Henry Darwin says the Environmental Protection Agency must be flexible as states they try to meet lower carbon emissions goals. Arizona faces the second-steepest cuts in the nation.